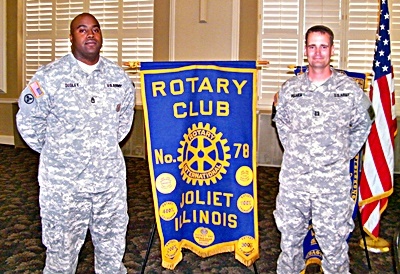 Captain Patrick Pelham (on right) and Staff Sergeant Carlandro Dudley of the United States Army Reserve were the guest speakers at the June 11 luncheon. The soldiers explained the purpose of the army reserve which includes supply delivery and medical care for combat troops as well as civil affairs with various countries around the globe. The U.S. Army Reserve Training Center is a multi-million dollar facility located on McDonough Street in Joliet. More than 200 soldiers are stationed here and work with National Security functions. The soldiers provide “army strength” to the local community.